You'll be £8.99 closer to your next £10.00 credit when you purchase American Expeditionary Forces in WWI. What's this? Any visitor to the site of the bloodiest battle in the history of the United States will be drawn to Montfaucon, for it is here that General Pershing, the Commander in Chief, determined that the major memorial to the American Expeditionary Forces would be sited. The impressive classical column, erected on the summit of Montfaucon Hill, can be seen from many parts of the battlefield of the Meuse-Argonne 1918. The village of Montfaucon, perched on and around one of the most notable heights in the Argonne area, was a first day objective for the First American Army in its massive offensive that was launched on 26 September 1918 and which rumbled on until the Armistice. Montfaucon had been the scene of bitter fighting between the French and the Germans in the early stages of the war, finally staying securely in German hands. The attack started well, with the great numbers of Doughboys easily moving through the first line of the German defence system; and, indeed, good progress was made all along the front, even if final objectives were not attained that would have brought the Americans up to the Hindenburg Line defences. The most notable setback was the failure to capture Montfaucon, an objective given to the 79th Division. Why the task of capturing this key part of the German line to a 'green' division, composed of draftees and which had only had six weeks or so of training time in France, instead of the prescribed three months, has never been adequately explained. What has proved to be controversial ever since is why the 4th Division, a regular formation that had already been engaged in battle on the Western Front and which gained its objectives on the first day, did not seek to assist the 79th when it was clear that it was facing significant difficulties in overcoming the Montfaucon defences. The outcome was that the village and hill did not fall on the first day. How significant this setback was to the success and the duration of the offensive has also been the subject of considerable discussion. Montfaucon was an important observation point for much of the war, providing distant views over considerable amounts of ground and thus invaluable for the German artillery. How much its loss mattered to the Germans when fighting a defensive battle, with the defence lines south of it already lost, is more open to debate, given the vantage points that the Germans continued to enjoy from high ground to the north-west and east. 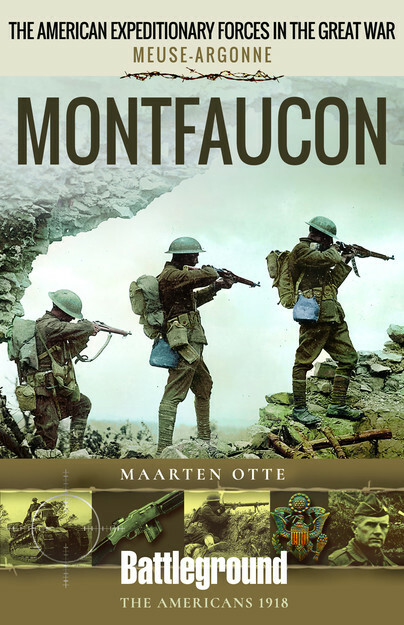 Maarten Otte sets the importance of Montfaucon and the ultimately successful effort to capture it within a succinct narrative. In the tours section he takes the visitor on a number of routes so that they can see for themselves the problems on the ground that faced the 79th Division and puts Montfaucon in the context of the wider battle. He also provides a detailed tour of the village and hill itself, including the magnificent memorial and the preserved defences and ruins which surround it. information that more extensive academic works do not include. Even if the reader never intends to visit the battlefield, this will provide a reliable reference work that is easy to thumb through and it will provide a first rate introduction to the battle. Maarten Otte is a long time resident of the Argonne, whose home is in Nantillois, situated between Montfaucon and Romagne. Growing up in the Netherlands with a fascination with the Great War, some eight years ago he settled in the Argonne, where he has developed his interest in the war, particularly the role of the United States. He has published books on Nantillois in 1918 and on US Medal of Honor winners. He now splits his time between writing on the war, conducting guided tours and assisting his wife in running their B&B in Nantillois.